This unit was developed using the "Penguin Readers" Factsheets with some of my twist to it. 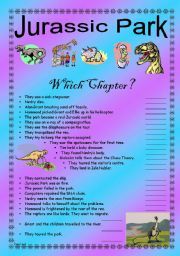 It focusses on: writing a dialogue, predicting, reported speech, regular/irregular verbs, comprehension, prepositional phrases, adjectives, nouns, adverbs, antonyms (opposites), completeing sentences, paragraph writing. Hope you find it useful. Cheers. This unit was developed using the "Penguin Readers" Factsheet with some of my twist to it! It focusses on: sentence writing, completing sentences, conjunctions, comprehension, discussion, writing, book review. Please remember to upload Part 1 and 2 for a complete 12 page unit of work. Hope you find it useful. Cheers. "Syllables" - What to do when reading new words. 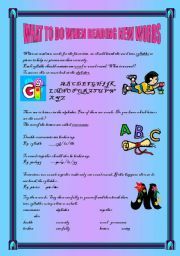 This worksheet focusses on teaching English Language learners how to break words into syllables or pieces to help them with correct pronunciation. I will also add a black & white version very soon. Hope you find this useful. Cheers. 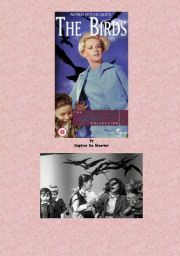 Again, this lesson complements the unit of work i´ve developed and am putting up on this website in pieces because the whole this can´t be downloaded at once. 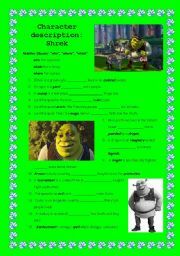 This Shrek adjectives Picture Grid also complements the Shrek Unit of work i´ve developed. It can also be used for varing ESL levels. 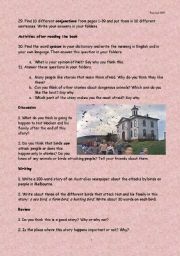 This Shrek Descriptive writing is one part of a whole unit of work i´d created and used on various occasions with my ESL students. 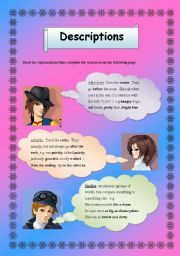 It can be modified according to the English Language levels of your students. The following characters are included: Shrek, Fiona, Donkey, Lord Farquaard. Hope you find it useful. Cheers.